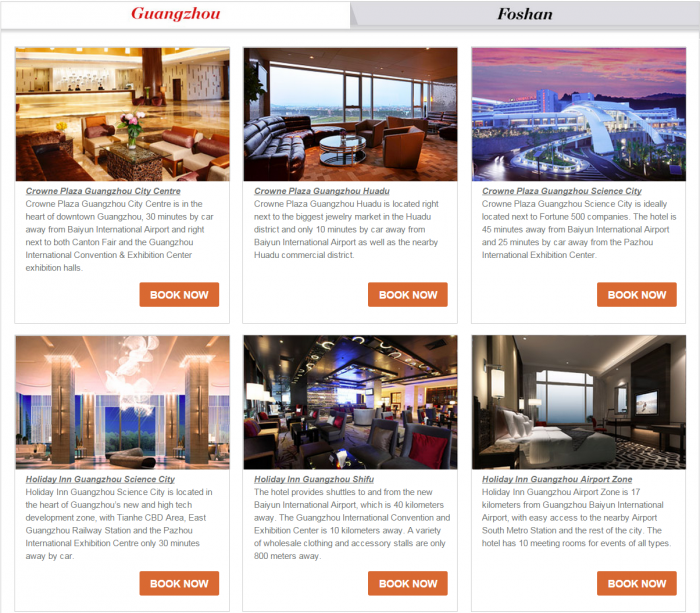 Canton fair around the corner and IHG Rewards Club has launched am offer for stays in Guangzhou and Foshan between April 14 – Mat 5, 2015, that are booked February 1 – May 3. The rate that requires a minimum stay of two nights includes 5,000 bonus points + other extras that business travelers attending to the Canton fair need. Canton fair is a big trade show and, unless you are attending to it, you should stay away from the Guangzhou area for the duration of it. “Canton Fair All-in-1” rates are valid for bookings made at least 2 days in advance for two consecutive nights or more from 1 February to 3 May, 2015, for stays from 14 April to 5 May, 2015. “Canton Fair all In 1” rates are per room per night and eligible for earning IHG® Rewards Club points or airline miles. In addition, IHG® Rewards Club members can receive 5,000 bonus points per stay at this defined rate. One night’s accommodations per room must be charged for guarantee purposes at the time of booking. Cancellation or changes must be made through the hotel at least 7 days prior to the arrival date. Any changes or cancellation after that will be deemed as no show and the full payment of one night stay will be charged as compensation. Tax, service charges and incidental charges apply. Room rates will be billed in local currency. Rooms are not transferable. Reservations are subject to rate changes and room availability. Free shuttle bus services to and from Canton Fair venue are available on event dates. Please check with individual hotel for the detailed bus schedule. The food and beverage 20% off is only for all-day dining restaurants and does not apply to room service. Free Internet access is available in guest rooms for stays at this defined rate.